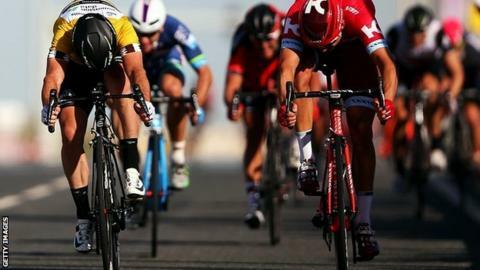 Britain's Mark Cavendish retained the overall lead in the Tour of Qatar despite missing out in a sprint finish on stage two. The 2013 winner, who won Monday's opening stage, avoided a crash in the peloton but was beaten to the line by Norway's Alexander Kristoff. Cavendish, riding for Team Dimension Data, takes a five-second lead into day three of the five-day race. The second stage was a test event for October's World Championships in Doha. "At the end of the day I was happy with how it went," said Cavendish. "On that finish I can't be too disappointed losing to Kristoff, he is strong on that type of finish. I am happy to keep the jersey." Sportsday: Is your club broken or beautiful? Read more on Sportsday: Is your club broken or beautiful?